Cooler temperatures and regular rainfall herald autumn in Central Texas–and we all breathe a sigh of relief that the broil of summer has passed. Perennials awake from their summer siesta, ushering in a second spring of blooms. From September until first frost, there are easily as many blooming beauties, especially of the native kind, as in spring. 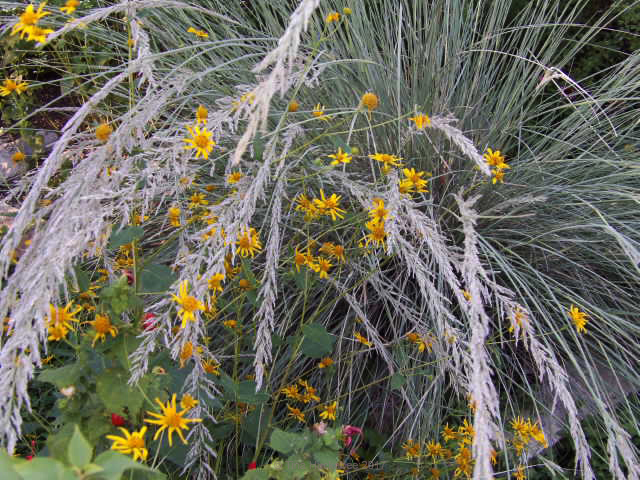 Our native grasses, soft and elegant throughout the summer, acquire a warmth of color and rock dramatic plumage in autumn, challenging the beauty of accompanying blooms. Big muhly (Muhlenbergia lindheimeri) graces a combo of Plateau goldeneye and Turkscap. I’ve had mixed results with Big muhly, as my front garden has historically been too shady for this sun worshipper, while my back garden offered only a few spots of sun, coupled with heavier soil, so muhlies were typically short-lived. With more opportunity for the sun to blast my front garden, the four Texas native Big muhlies planted have found a home. The same muhly at a different angle. Common yarrow, Achillea millefolium, is a native North American plant which grows throughout the continent. A beautiful ground cover for most of the year–especially in winter–yarrow blooms white clusters atop 2-3 foot stems in June and July, the florets turning toasty in August. Mine haven’t bloomed particularly well in the last 2 years, but I don’t mind, since it’s the lacy foliage that I prize. 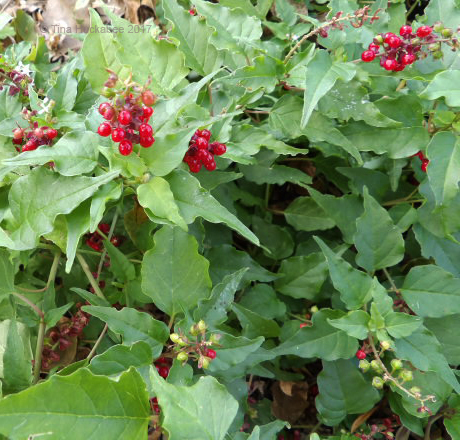 For wildlife, autumn provides a boon of berries, and Texas native plants oblige in spades. 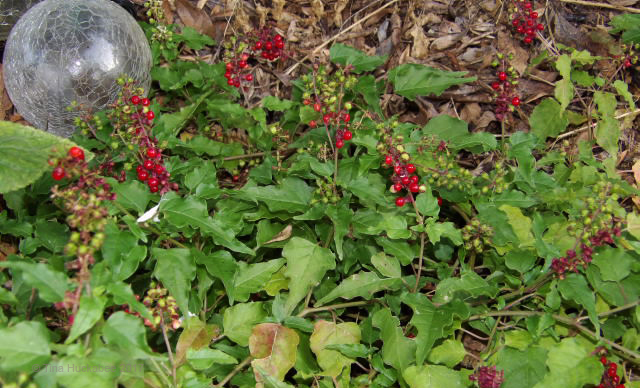 Pigeonberry, Rivina humilis, is a favorite of birds, especially–you guessed it–of pigeons and doves. Leaves are ruffly and bright green, complementing both the tiny pink-to-white blooms and the cherry-red berries. Once a light freeze happens, the foliage will blush burgundy, until a hard freeze renders this small ground cover dormant until late spring. For now, the leaves remain a cheery green. 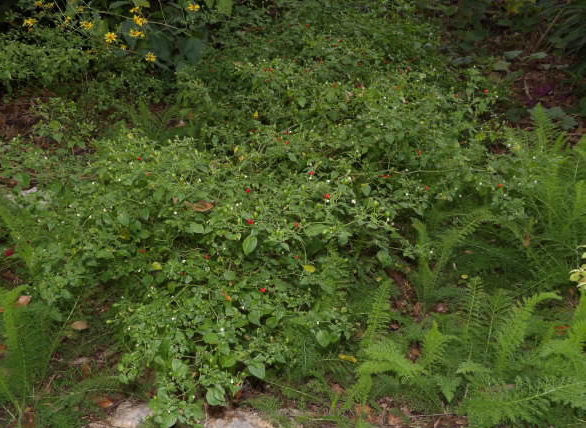 Another native plant, the deciduous herb, Chili pequin, Capsicum annuum, provides fruits for birds and mammals. 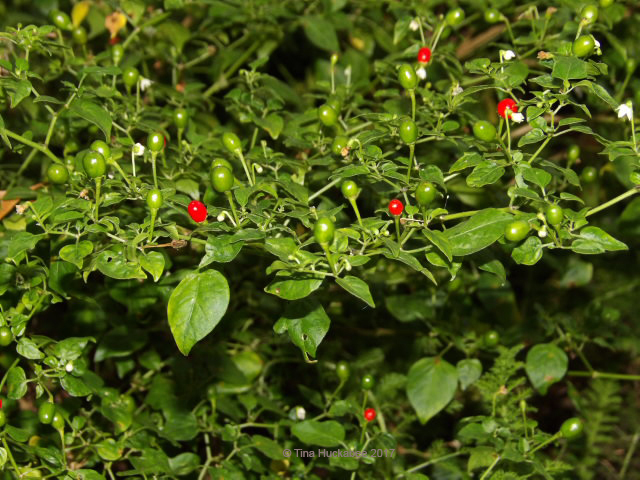 Birds are frequent visitors, so much so that another common name for this plant is Bird pepper. Texas’ only true native chili pepper, the fruits are hot, but birds (and husbands) love the taste. Red berries, ripe for picking. The leaves are small and dainty, and the form of the shrub, elegant. I love them planted as a mass, with 3 or 4 together. Chili pequin planted with common yarrow. Mexican Feathergrass, Nassella tenuissima–for obvious reasons that you can observe, has become a popular landscape plant throughout North America. This is the spring view of two of the Mexican Feathergrass in my garden. 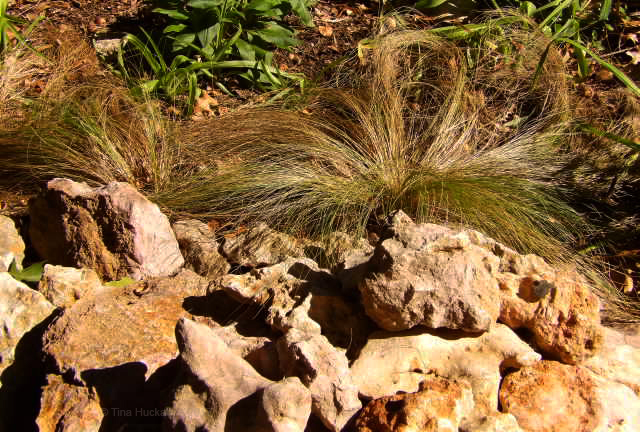 Native to Texas and New Mexico, southward into Mexico, and with a separate native population in Argentina and Chili, the Mexican Feathergrass is a tough, drought-hardy perennial grass prized by gardeners and easy to grow. The autumn view of the same two plants. More muted and worn from a full growing season, these two still accent the garden and complement the rocks which border the pond. 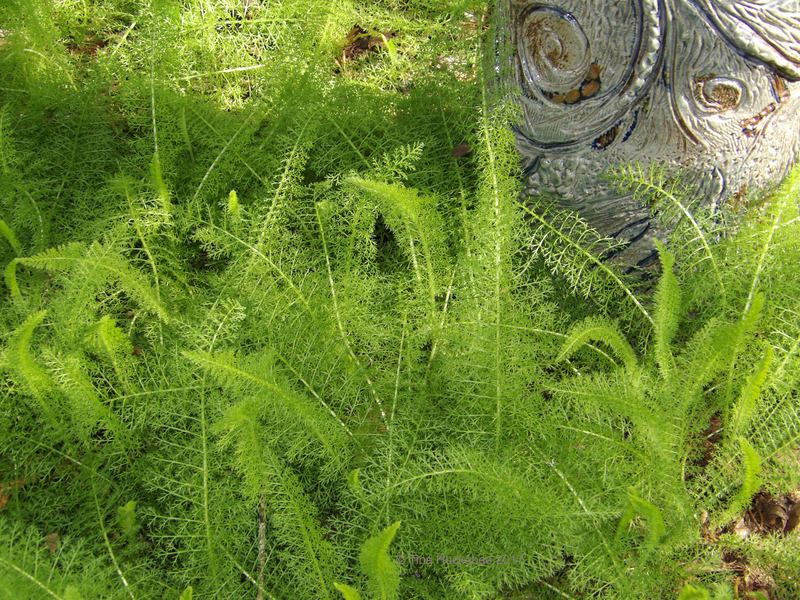 I’ve grown Feathergrass in both shade (not deep, but dappled) and sun. It’s been the native grass that has performed best for me and seems a go-to grass for both home and commercial landscapes in these parts. It seeds out, not obnoxiously, but just enough that I can transplant and use in different situations. Thanking Christina of Creating my own garden of the Hesperides for hosting this monthly tribute to foliage; please check out her lovely blog for more fall foliage fanfare. 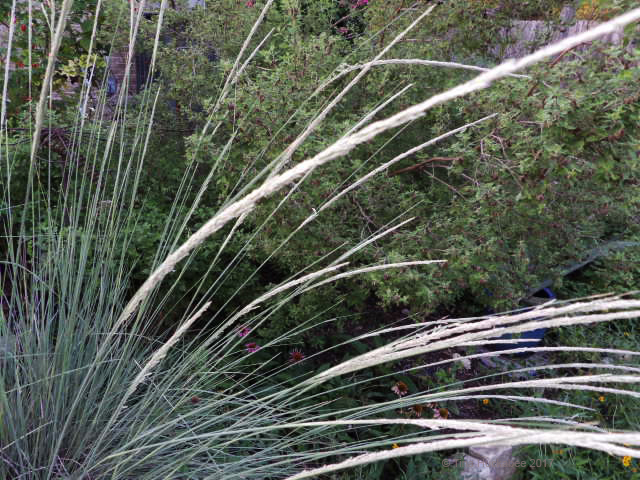 This entry was posted in Gardening with native plants, GBFD, Uncategorized and tagged Big Muhly, Mexican Feathergrass, Pigeonberry by Tina. Bookmark the permalink. Drier parts of California get that second spring too. We even have a native buckeye that is ‘twice deciduous’. It loses its foliage if it gets hot in summer, and then gets new foliage temporarily in autumn. It does not often have any leaves on it as you can imagine. I think it’s a common weather pattern for those parts with milder winters. Wow–I love buckeyes and what a treat to have ‘double prizes’! You might not like it if you saw it. It is bare more often then not, and the thick branches look like antlers with naughty male parts hanging from them. The bloom would be nice, but usually appears just as the first set of foliage is getting grungy. Mine were nice only because they were in a cool and shaded spot, so stayed foliated through summer, and then got fresh bright green foliage in autumn. I do like the flowers because they have a thick buttery fragrance, and because they are white. They can be nice as an understory tree. Most people are surprised that we have our own buckeye here. Our native buckeye blooms in spring–magnficent crimson blooms and the butterflies are nuts for it. It also loses its foliage in August, so it’s best planted with other, still foliaged, trees/shrubs. I like that description: ‘naughty male parts’–plants are so evocative! September rains usually bring us a second spring too; this year there are less flowers around as the rain didn’t really arrive, cooler temperatures did though so most plants regenerated giving some good green. I’ve never heard of Rivina humilis; I like it a lot; I must look for it. Thanks for joining at such short notice. We had rain in September, but I will say that we’re in a dry period now–we could use a few drops, here and there. The R. humilis is a great little plant, especially for shade/dappled shade. I’m always aware of the 22nd of the month; whether I have it together enough to participate? That’s a whole other thing! Thanks for letting us northerners vicariously enjoy your second spring. Lovely! Haha–you’re welcome and remember to send some cooler summer breezes our way next July/August! I particularly love the grasses. Next year I am going to grow Muhly grass. I love the idea of a second spring in November, our gloomiest month. I love the hardy grasses of this region, too. One of my frustrations with gardening is that my plot has been too shady to for grasses to thrive, With some changes to my landscape (mostly out of my control, but not unwelcome) that’s changing and the grasses now have a place. While we Texans enjoy our second spring, remember that it comes on the heels of a long, hot summer! Tina her herbs are wonderful: especially Feahtergrass that is very cute. The common Yarrow also I have in my garden and was born spontaneously. It is a plant that I love because of its white flower and its leaves that look like ferns. The pequin chile is beautiful with its red fruits when they are ripe and it is a real chili. In addition, a good plant feeds birds and mammals. I love all the plants and their wonderful photos. Tina have a good week. Greetings from Margarita. Thank you, Margarita! 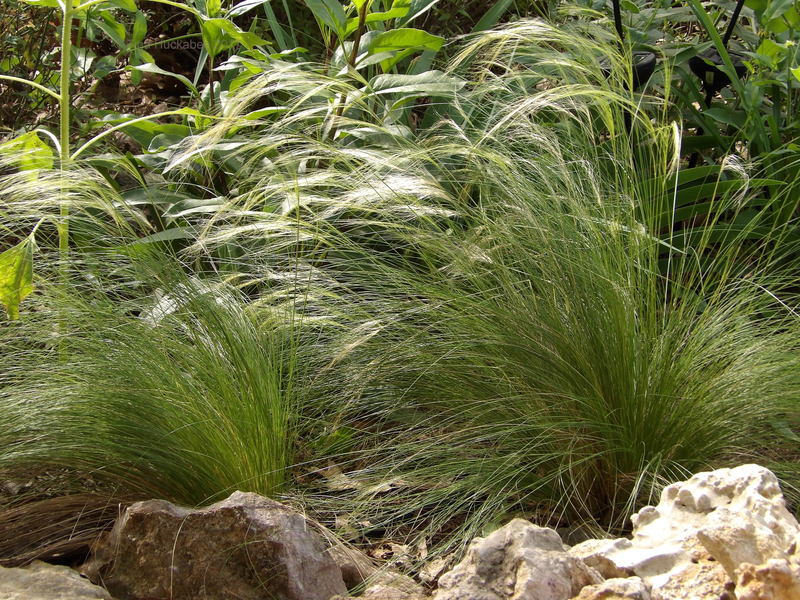 Yes, I like the Feathergrass very much–so easy to grow and pretty in the garden. I know that yarrow is common in Europe and it’s also a nice plant. Thanks for reading–you have a good week, too! I’m not certain I’ve ever seen pigeonberry. It’s beautiful, and I especially like the thought of that colored foliage post-frost. I know Gulf muhly, but I’m not sure I could identify other muhlys. I need to work on that. I just got a new book by Brian and Shirley Loflin, which you probably know: “Grasses of the Texas Hill Country.” There’s a nice introductory section, as well as absolutely splendid photographs that really show off the details of the grasses. As for a second spring, I was amazed to find a relative long swath of ditch on Sunday that was filled with green milkweed, in bud and in bloom. It was being visited by several insects and butterflies, including what I think I remember as carpenter bees. I think I remember you talking about how loud their buzz is. If I hadn’t learned a good bit about bees, I would have been terrified, but I clearly didn’t rate nearly as high as the milkweed in their book! I have not noticed this disease with the house finches here, but maybe I’m not looking closely enough. I’ve only seen it twice and House Finches are year-round residents here. Those tiny red chilies are interesting. I always thought that birds were unable to taste hot foods, but maybe they just like it spicy! I think birds don’t taste ‘hot’. I’ve seen suggestions for keeping birds out of pots, etc., by sprinkling cayenne pepper and the like. I was at the Lady Bird Johnson Wildflower Center last week and saw Lindheimer’s muhly in plenty of places there. That’s a great place to see many native plants–love to go!